This crab-studded mac and cheese will make you anything but crabby! If you can’t find crab seasoned chips go ahead and replace them with plain chips (or crushed Saltines) sprinkled with a little Old Bay. Preheat oven to 375 degrees Fahrenheit and prep an 8×8 inch casserole dish with baking spray. Cook al dente pasta according to manufacture’s instructions then rinse and set aside. In a large pot over medium heat, melt butter. Whisk flour into butter to form a roux and cook 1-2 more minutes until it has slightly darkened. Whisk milk into roux and cook 3-4 more minutes until thickened, stirring out any lumps as needed. Working in batches, stir cheeses into sauce. Reduce heat to low and stir Old Bay, fish sauce, lemon, and garlic into sauce. Remove pan from heat and stir in pasta, green onions, and crab, tossing until mixture is well-combined. 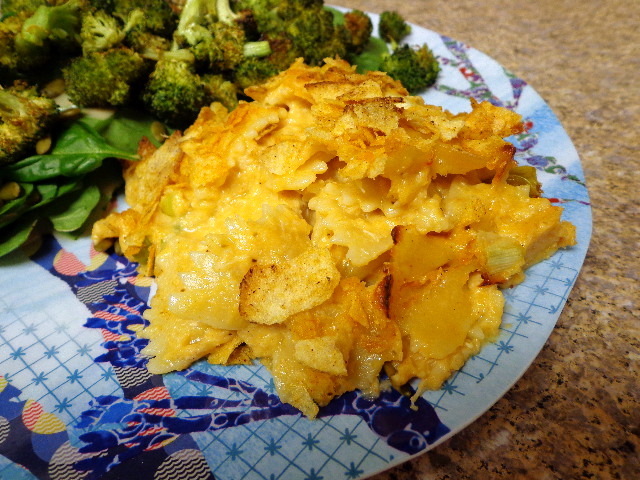 Pour into prepared casserole dish and top evenly with crushed chips. Bake 23 – 25 minutes.